Everyday during the summer many hikers on the Pacific Crest Trail walk through the beautiful Castle Valley in the Donner Summit area. Little do they know that they walk right by signs left by Native Americans that shared the same experience thousands of years ago. 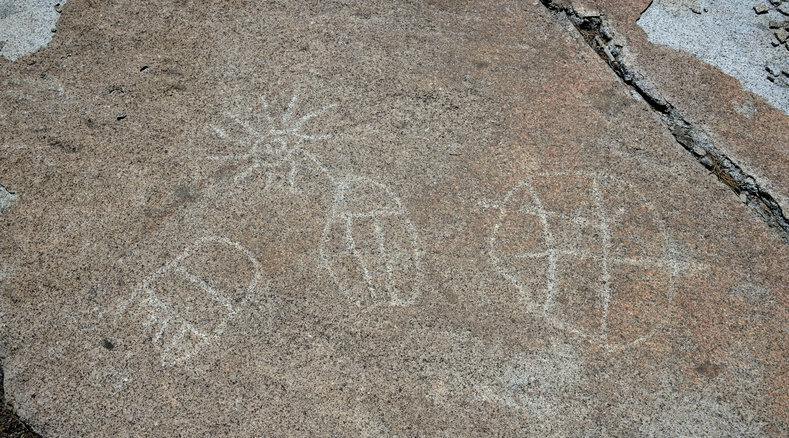 The Native Americans that spent the summers in the Donner Summit area must have had a real appreciation for the area as evidenced by the widespread presence of ancient petroglyphs that they decorated many of the rocks in the area with. The significance of these ancient glyphs has been obscured by time, but whatever their purpose it is clear that this area made the same impression on the ancient travelers as it does today. hide the location of these wonderful relics of the past. Why some people feel the need to put up a veil of secrecy around what was obviously a very public display is a mystery to me. Yes, I understand that there is a very small number of bent people out there that are wont to vandalize things. What are the chances those people will take the time to hike out to a remote site. I would say that the most pernicious vandal out there is mother nature. Every year the seasons weather the granite slabs and exfoliation of the granite does far more damage than any human intervention. 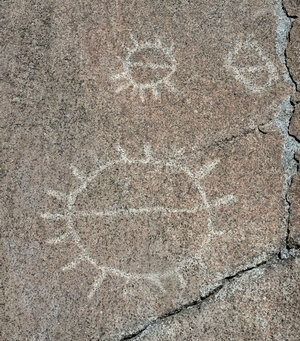 It is hard to understand what the point of “saving” a petroglyph by keeping it secret and preventing people from seeing it when it is just a matter of time before it is obliterated by natural processes. OK, I’ll get off my soapbox! Seeing these ancient beauties will involve a bit of walk out into the Castle Valley (see map below).If you go out in the summer, the gate on the road is usually open and you can driveout to the parking area at the far trailhead to Castle Peak and Peter Grubb hut. If you go when the gate is closed, you will have to hike the 1.5 miles up the road to get to the same parking area. From the parking area proceed about 200 yards up the trail to the first intersection where the PCT comes in from the right. 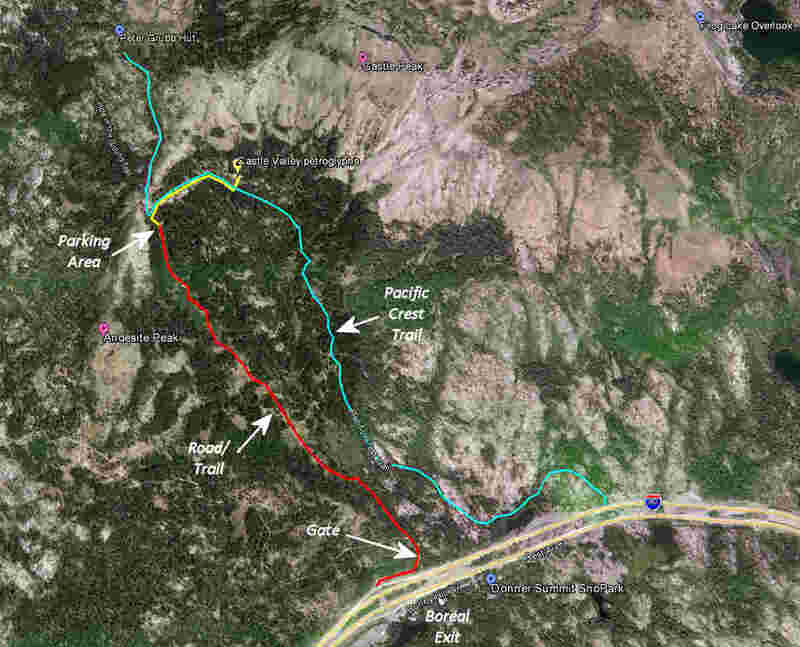 Bear to the right onto the PCT and walk about 1/4 mile until you see the first granite slabs on the left of the trail. At this point you will be tempted to strike out up the slope to the slabs. 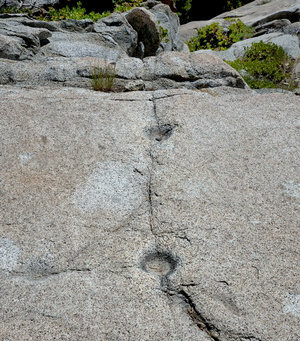 You can eventually find the glyphs if you wander east through the slabs (that’s the way we found them), but it is easier if you stay on the trail for another 200 yards or so and then head up. 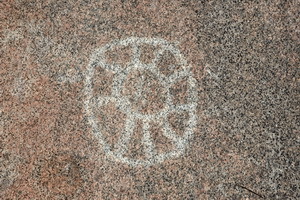 The glyphs themselves are spead out in the middle of one of the largest slab areas. When you find the glyphs, make sure you explore 5-10 yards to the west to find the two grinding depressions used to grind seeds and tubers. This is the only spot on the summit so far that I have seen glyphs and grinding rocks in such close proximity. If you stand on the slab at the petroglyphs and look out over the beautiful Castle Valley you can easily understand what may have motivated the ancient travelers to create their signs at this spot.